Painting a picture of the economy is something business journalists have to do regularly. As much as they might try to make these narratives relevant to the populace, generally it is something that the majority skip past when reading the paper. So, saying the number of smashed avos going around is one of the reasons first home buyers can’t afford their deposit, was always going to be more interesting than fundamental economics. Obviously, the two have almost nothing to do with each other. Though when you venture out to the suburbs for lunch on a Wednesday, you don’t necessarily expect a full cafe that is turning over tables multiple times. Sure, Mr Hendricks has a great reputation, and while this is a sign of an affluent economy, I’m not going to draw the long bow that this means housing deposits are being overlooked for another smashed avo. If you were to be neglecting your housing deposit for breakfast or lunch, I wouldn’t blame you for starting here, with an enticing menu, and a couple of single origins on hand. On the latter, I tried both single origins and they are expertly crafted, with distinctive flavour, sourced from Guatemala and Panama by Padre Coffee. Catherine had Greene St Juice Company’s “The Hamptons”, which is the first we’ve seen of this brand, but it is certainly worth sampling. For lunch, I instantly was intrigued by the charcoal prawn roll and had no trouble in narrowing down my order, until I realised there are many other great options. 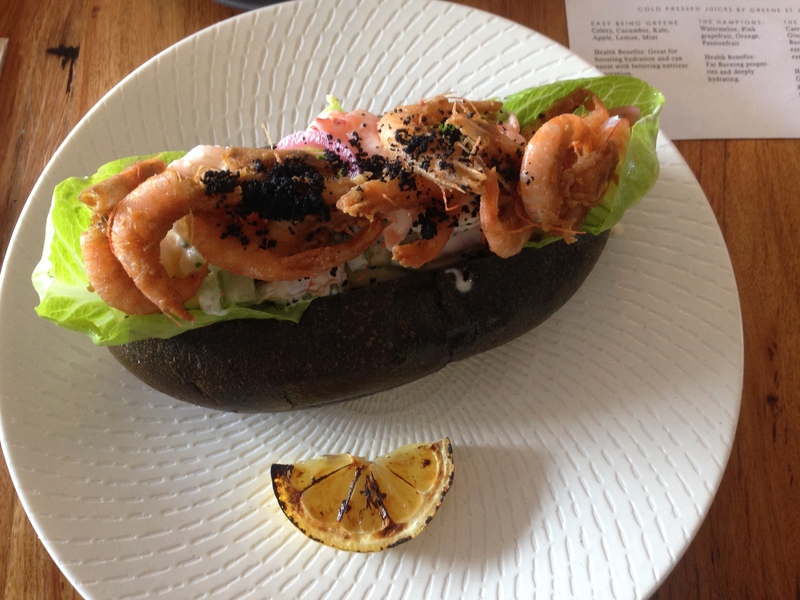 The charcoal bun is more a gimmick to me than about adding flavour, but it does look cool. The prawns on the other hand, plump, juicy and fresh, on a cos leaf, plus some soft shell fried prawns on top, are abundant and delicious. The cubed celery, and apple, works well with a nice mayo bringing it all together. The fried prawns in their shell did add texture, but I must admit that a couple of them gave me a sting in the mouth! 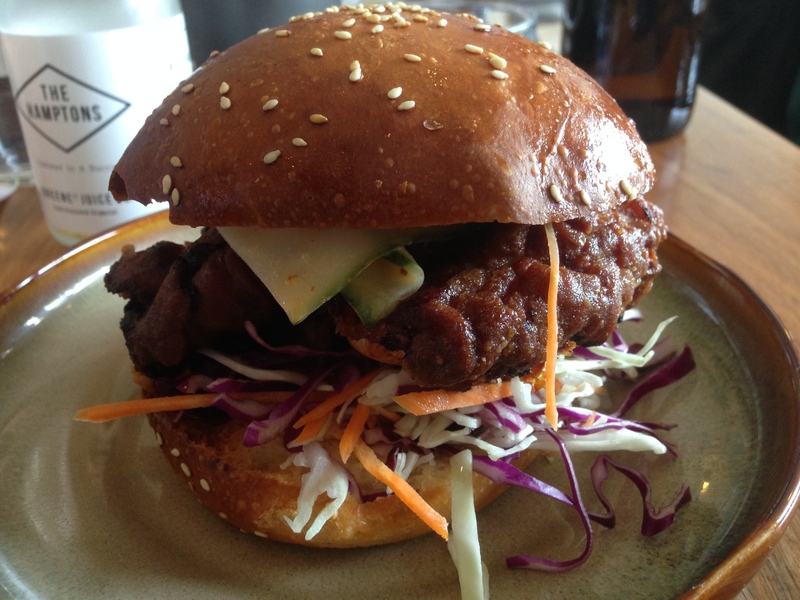 Catherine ordered the fried buttermilk chicken brioche roll and I was close to having some menu envy. It was delicious, as fried chicken generally is, and the accompanying Asian slaw added to the flavour, with shredded cucumber, and slightly hot kewpie mayo finishing off the combination, all housed in a fluffy brioche bun. I enjoyed my multiple tastes. We drove out to Mr Hendricks on a pretty depressing rainy day. Once we were inside, there was an instant warmth in the food, coffee and service, making it abundantly clear why this cafe has such a good wrap. 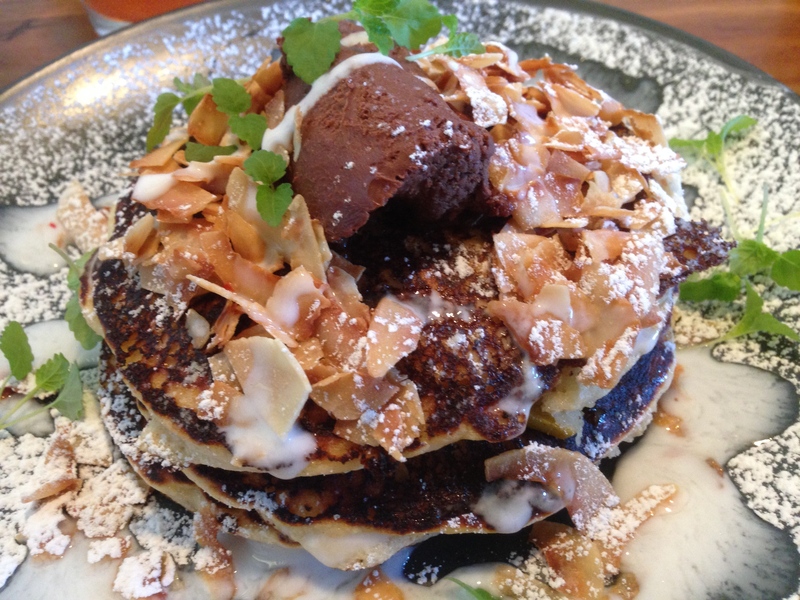 It is completely worth the drive out to Balwyn if you are not a local. There are several places that have been on the extended list for as long as I can remember, but for one reason or another, fate has not aligned to allow a visit. In the case of this cafe, Catherine and I have attempted to eat there more than once, and it has always been closed when we’ve decided to try! It’s funny sometimes when these visits don’t line up, and all of a sudden you have not tried a place years later, that is walking distance away. Cheerio is one such place. For this reason I’ve noticed consistently good reviews and high scores on formats like Zomato over that long period. One reason cheerio is always full is that it’s tiny. So we were pleased to find a spot on the communal table for two on this particular morning. The menu is quite diverse with the dishes you would expect, but often with twist; some Asian influences especially noticeable. 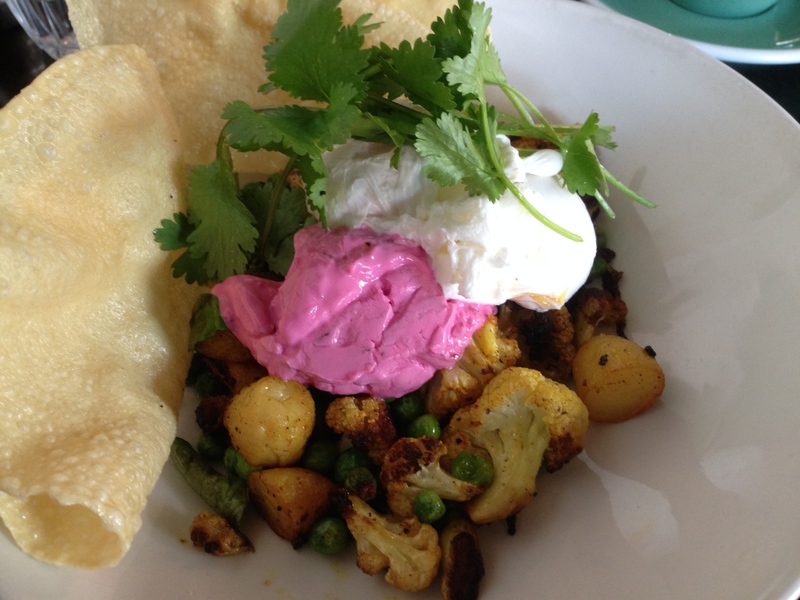 The dish I chose, is one that is infiltrating many cafe menus, and I find this to be an excellent thing. 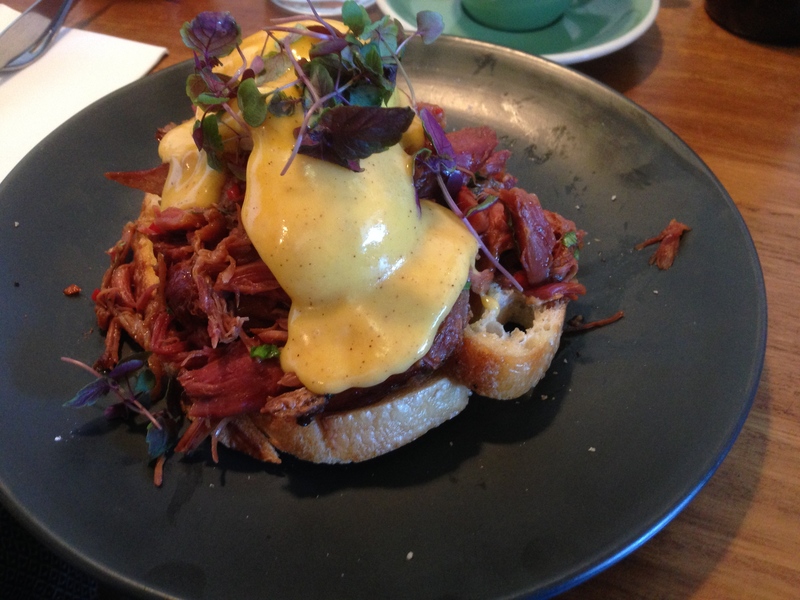 Traditional eggs Benedict with ham, is being taken over by indulgent pork hock as the dominant staring ingredient. Cheerio’s Asian influenced version is excellent, with Asian herbs, chilli and black vinegar, not to mention a tamarind slant to the hollandaise and perfectly poached eggs. We noticed around the cafe that it was popular choice for good reason. Catherine was fairly envious of my dish, because she was not enjoying the texture you would ordinarily expect from pancakes. The reason was the strips of mango had their skin left on, and were dispersed through the pancake stack, making it unpleasant to eat. Having had a taste, the pancakes were nice, but trying the mango with its skin made each mouthful difficult to eat. She couldn’t finish, but we did notice several others around us did, meaning it could just be an acquired taste. However, it is not unreasonable to think the description on the menu would warn you about eating the skin of a fruit that is not traditionally eaten. While my research tells me it is generally healthy to do so, I couldn’t find anywhere that says it adds flavour through its leathery outer layer. 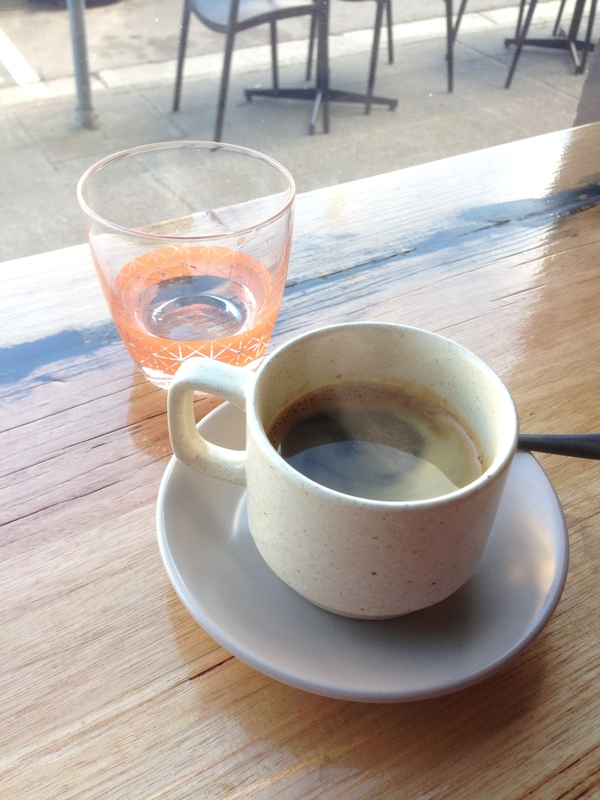 Coffee by Five Senses is well made, and service (besides not conceding that the mango skin should be identified on the menu) is good. It is a healthy business with an excellent following, and definitely worth a try. Hold the pancakes. What a wonderful day in football history, starting off with breakfast in the western suburbs at The Cornershop in Yarraville’s cute village strip. With thousands of fans and members that would’ve found it impossible to get a Grand Final ticket, a live site had been set up in the mall. As the atmosphere grew we walked in for a midday breakfast not long before the kitchen closed, with the staff having a chance for their own grand final celebrations. This time last year we had already finished an enjoyable breakfast and were on our way to the MCG, but it was not to be for the West Coast Eagles this year. Despite an early close, The Cornershop is brimful. With this place recommended by more than one we knew we were in for some good food. There were several options that appealed to us, but I settled on the chilli scramble with parmesan, cavolo nero, and soft herbs; and Catherine on the cauliflower and potato hash. Whilst Catherine’s dish was not well described (see photo), the cauliflower was absolutely delicious, with a beautiful chargrilled finish. 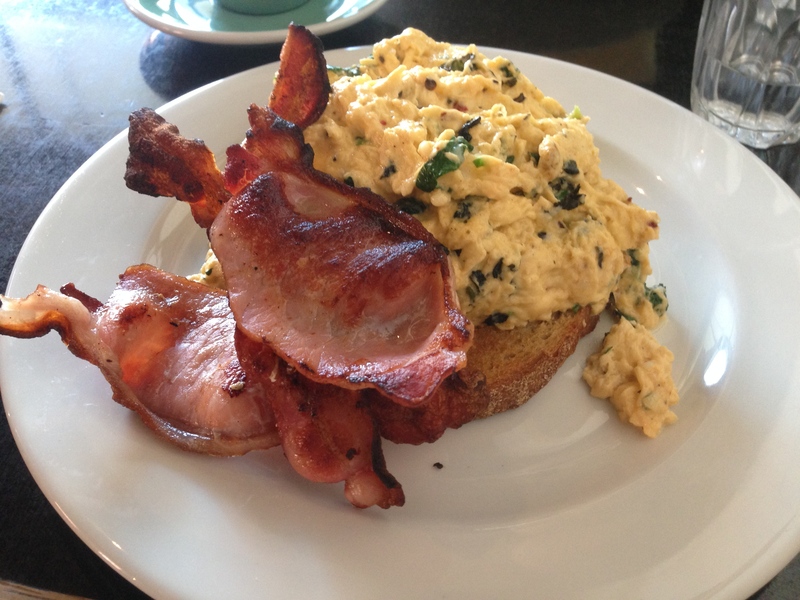 My scrambled eggs were really flavoursome with cavolo nero really adding a distinctive flavour that worked beautifully. Toast that was actually buttered was a bonus! Unfortunately the one critique was the crispy bacon which was barely warmed. 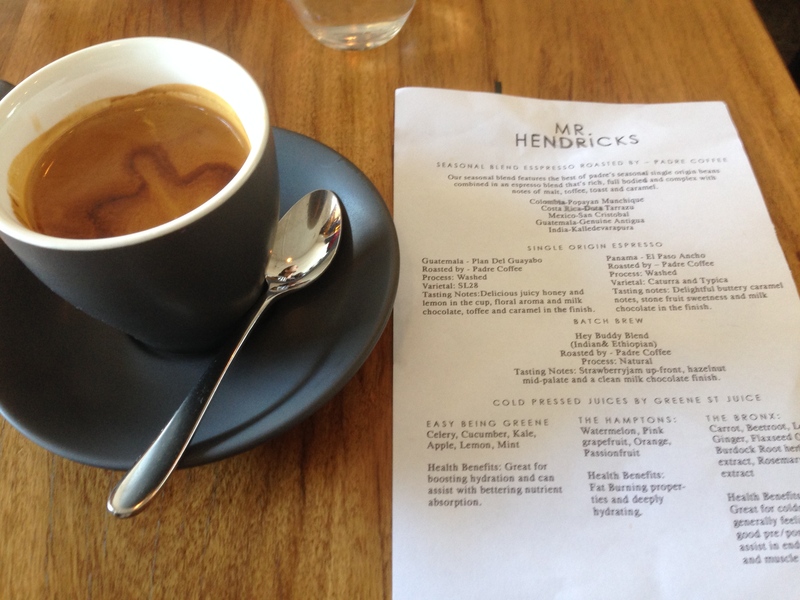 I tried a couple long blacks and they were both consistently good without being amazing. Catherine’s strawberry and apple juice on the other hand was stunning. The great food and drinks were accompanied by excellent service, with one killer male wait-staffer doing a fantastic job. The western suburbs are full of excellent cafe options, and now they have a premiership cup as well! There are tens of apartment blocks going up in Richmond at any one time; all the time. That is not necessarily a good thing. On the flipside, the almost comparable number of cafes with good looks, sharp service, and great food, is a far more attractive element. Given a moment to think, one could very quickly reel off half a dozen new cafes that have begun life in Richmond in the past year. Jethro Canteen, on Burnley Street, at the back East end of this great suburb, is the latest to be born. There are some nice differences in the fitout that set it apart from many others in recent times, but it is still the clean minimalist look associated with this era in design. I particularly like the flourishes of green, and the exposed brick, in this wide rectangular double fronted old shop. Naturally with the length, the windows allow a lot of light through to fill the cafe with brightness. As you would expect, on this first Friday of operation the cafe is full at lunch. We wait for a larger table of blokes to leave and our turn comes not long after arriving. If the wait time is too long, there is always Friends Of Mine a few minutes around the corner, or even better, Penny House just down the street. Instantly there appears to be a go-to dish in the form of the Jethro chilli dog. In fact, all three of the gentleman on our table instantly order it. 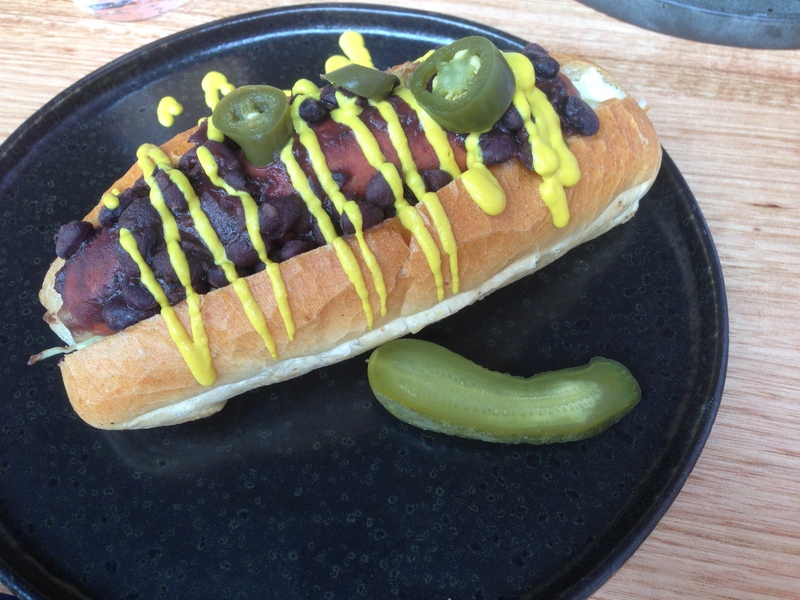 I have a lower heat tolerance than Graeme and Ralph, so I use less of the jalapenos provided, but there is hot mustard on top of the brioche bun, and flecks of chilli in the frankfurter sausage, that gives the right amount of zing. It’s good, and I would go back for it again, but I would equally go for the fried chicken in charcoal brioche! The coffee is good too. And I’ve been back twice to make sure! Each time there have been a surprising amount of staff, which is a great thing if it keeps up, because the crowds are already hitting up the cafe all times of day. All I can say is keep the great new cafes coming, but please halt the number of new apartment blocks!